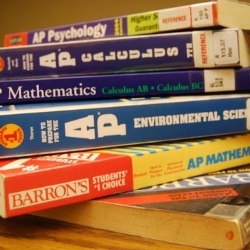 SRVHS offers Advanced Placement (AP) courses for students who wish to pursue college-level study while they are still in high school. The AP program is a cooperative educational endeavor between high schools and colleges and universities. It gives students exposure to college-level material through involvement in an AP course, and gives them the opportunity to show what they have learned by taking an AP exam. Based on exam scores, colleges may choose to grant credit, advanced placement, or both. Students who enroll in AP courses are encouraged to sit for the AP exams in May. A student who wishes to enroll in AP courses will be expected to undertake rigorous and sophisticated assignments and to work independently. Most AP courses require multiple page papers and some research. It is important to be realistic about the level and number of AP courses a student can take and still be successful. While students can ultimately decide whether or not to take a particular AP course, they are advised to give serious consideration to the recommendations of their subject area teachers. AP courses are given a weighted grade in determining grade point average (GPA). Government and Politics - U.S. Course offerings vary per year depending on student request/enrollment. Students are required to attend school before and after an AP test. In order for your student's absence during the AP test to be considered excused and marked accordingly (ACT) they must be present in the class following a morning AP exam or present in class before their afternoon AP exam. California's compulsory education laws require children to attend school, with a limited number of specified exceptions. Under state law, a pupil who is tardy or absent for more than 30 minutes during the school day on three occasions in one school year, is considered truant. Any classes missed outside of the testing time will be marked as a cut.